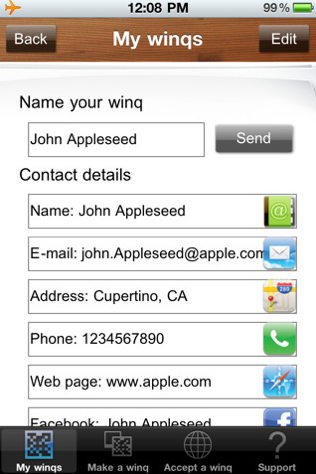 Developer Quote: "Winq is simply the easiest way to share contact information between people. 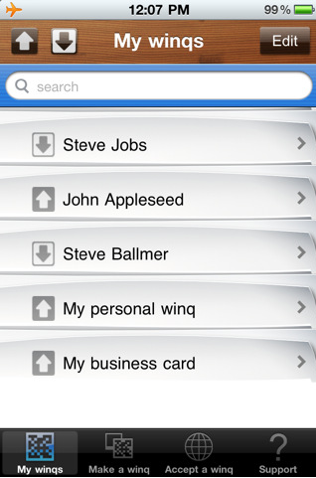 With Winq you can forget about business cards." We are a very social and high-tech generation. Almost everyone these days has several social network IDs, addresses and perhaps a website. That's in addition to basic information such as address, phones, etc. There is a great deal of time and effort used to input all this data into your Contacts list when you need to store a business acquaintance, friend or family member's information. Do you really want to type this one letter at a time into your device? Then I learned about Winq which takes a big job and makes it incredibly simple! 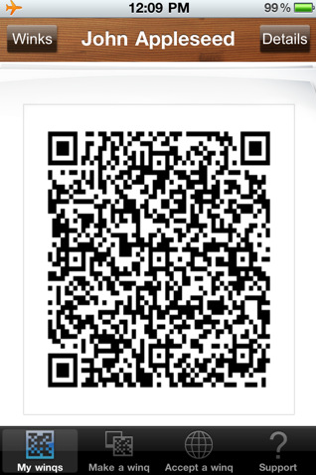 Winq is a QR-code (or type of bar code) which when scanned yields all the information that has been entered into it. And, by the way, did you know QR is the abbreviation for Quick Response? Because that's exactly the function of these codes - to enable instant action accessing data. 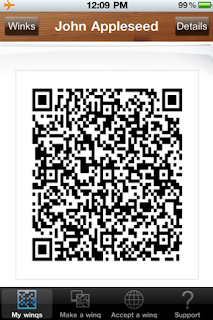 A QR-code consists of black modules arranged in a square pattern on a white background. Barcode readers or camera phones can read the data embedded in this pattern. That's all there is to it! Rather magical, actually! For example, I have made my own winq (or barcode) with several of my social networks and other contact info. That winq can now be scanned by someone who will insert this information into their Address Book, or I can simply mail the winq to whomoever I please. Quite frankly, it is a snap to share your contact info once your winq is set up. But the icing on the cake is then using one tap to access your friends' networks from their winq barcode which you have saved on your device. So what do you think - do you really need to exchange paper business cards any more? In my mind, I am happy to be done with storing and often losing these cards. My winqs are all I need to be connected to colleagues and friends. Here's how to use this awesome QR-code, social networking app. Open the app, and you will be prompted to use the Tutorial to learn the few, easy steps involved in making a winq. You will also see a file cabinet drawer with 3 folders labeled My winqs, Make a winq and Accept a winq. If you don't read the tutorial immediately, you will find it very easily at the bottom of your screen under the Support tab. Tap Make a winq and name it. Tap Add Details (top left) button to insert the fields you want included. You may choose details including Name, E-mail, Address, Phone, Middle Name, Web page, Mobile phone, Work phone, Home fax, Work fax, Organization, Job title, Work address, Home address, Facebook, Twitter, LinkedIn, Skype, Google Talk, AIM, MSN and Note. Add or delete fields using the Edit (top right) button. Once your own winq is created you can easily share it. 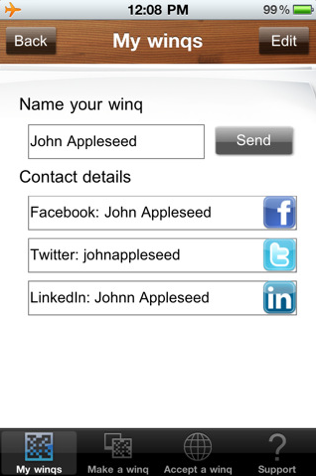 Have a friend or new acquaintance scan your winq with his phone, or tap Send to mail via in-app e-mail. (One caveat, however, is that this 0.9 version of Winq is equipped to decode only QR-codes with contact information in Mecard standard. An update to support other QR codes will soon be on its way). The winq will be saved in the Photo Library. To Accept a winq, simply go to this Library and select a winq. 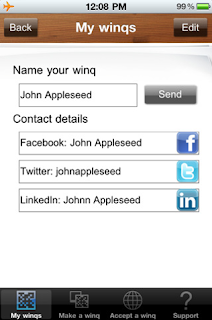 Tap on the Address Book shown to insert this winq (information) into your Contacts. You can also immediately access your friend's social networks, or data entered into other fields by tapping the icon next to it. Making and accepting winqs is easy, quick, and so much fun. Think about the convenience while out one day and meeting someone with whom you'd like to keep in touch. Have them scan your winq with their phone. If they have their own winq, you can grab theirs. 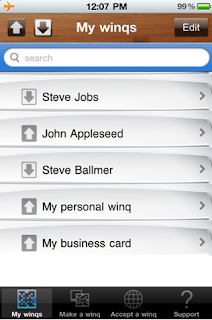 (The good news is that winqs will soon be able to be taken directly from the Contacts list!) This high-tech app is great for parents who make new friends while out on the ball field, for business associates, for a night out on the town, for teachers who may want to share certain communication data, and so forth. Open up your social networking life with Winq, because with the wink of your eye you have contact info of those you choose listed in one small QR-code! COOL CONCLUSION: "Never let a potential client or friend slip away when you can easily and instantly use Winq to exchange the social data you choose!" --Special Note: Winq Lite is also currently available for FREE on the App Store, if you'd like to try before you buy.